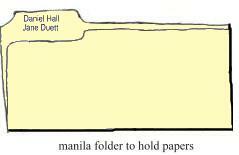 The Family Research Folder is a manila folder in which research notes and documents are kept for one family. The names of the husband and wife are used on the label. For example: a Family Research Folder for your family would have your name and that of your spouse on it. 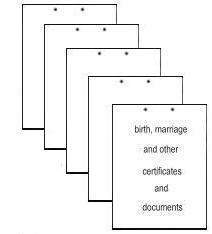 It would contain a copy of each immediate family member’s birth certificate, or other verification of birth. Additionally, it may contain a copy of your marriage certificate and any other documents needed to verify the names, dates, and places of important family events. and any maps you would wish to include. 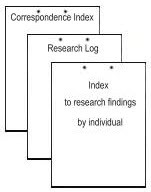 There might also be an Index to Research Findings, a Research Log or Calendar of Search, and an Index to Correspondence in the folder. These three forms will be covered in more detail later on. 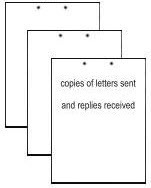 It is strongly recommended that all the papers in the Family Research Folder be fastened together by the use of some type of metal paper fasteners — not staples — so as to avoid losing some of the contents of the folder should it be dropped or tipped. Staples are not good because it is more difficult to add to papers which are stapled together. With all the research notes divided into family folders and each folder having all the notes and documents for one family unit, it becomes easier to determine what has been done and what should be done next.